I’m going to share with you guys today a couple of recipes. These recipes are for one of our friends from North Carolina way. She’s very active in her comments on articles we discuss, and is a very, very knowledgeable in regards to gardening, canning, cooking, and I have come to believe…most anything in general! If you’ve been reading this site for very long you’ll recognize her as Bonnie! Well, Bonnie kept sending me little teasers about a wild growin’ veggie, and she kept referring to it as “ramps.” I’m sure many out there are aware of what these are, but I gotta’ admit that I had no idea what a dern “ramp” was. The recipes today come from this book, and honestly, from what I’ve already read, I believe many of you would get a kick outta’ readin it! There’s many, many different recipes, and it’s full of stories to boot! It’s good sittin’ out on the porch, kinda’ just coastin’ in the swing, letting the world go right on by ya to read! It is written by Joseph E. Dabney, and is about the folklore and art of Southern Appalachian cooking. We purchased this at Books A Million, and I know it goes without saying you could purchase a copy from Amazon.com. Once I got to just goin’ through it, what did I find? Ramps! Now knowing Bonnie, she may already have these, or do something quite similar with her beloved ramps. But for the people like me who knew nothing of them prior to Bonnie’s introduction…well, who knows, if you ever run across any, you might at least know where to start in cookin’ up a mess of them? Before I jump off any farther in regards to giving Bonnie a couple of these recipes, I figure I might wanna warn you guys about these…ramps. 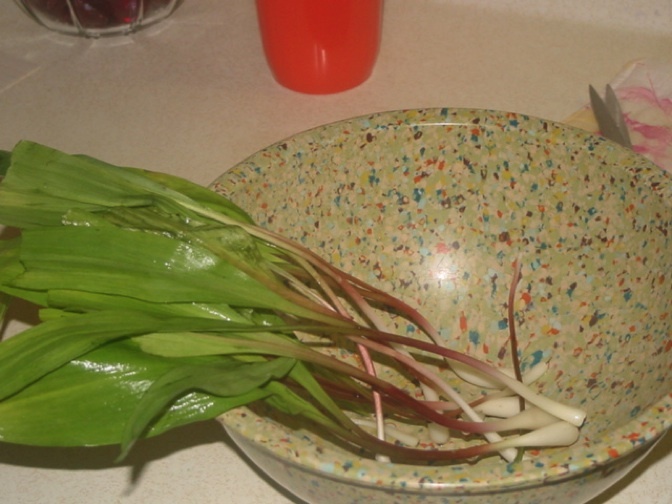 One of your readers wanted to know about ramps that grow wild in our mountains. I posted a link for her. Actually, I was going to post a picture of some I was cleaning for us here at the shack on the mountain, but didn’t know how. Ha ha! I am attaching a couple to this email. I should have said cleaning for ME, not us, as Steve wouldn’t touch them with a ten-foot pole! It’s true that if you eat them day after day for a week or so, you will stink if you sweat, and there is no avoiding it. Well, he can just suffer during ramp season, because this old gal is gonna eat them while the gettin’s good! Well………..maybe a little more often than that, as I also have canned and frozen them. They are just plain old GOOD! “You will stink if you eat them day after day for a week or so…” is what Bonnie herself says…Okay. And there’s more, but I’ll just cite those two, along with Bonnie’s own confession. Sounds to me as if “Ole Steve” might be onto something! No actually, the people love them, and speak highly of ramps through their conversations, and honestly I’d love to try some myself. The reasoning for this is two-fold. The first being that I’m sure I’d like them, and the second is really kinda of personal, but since many of us are on a first name basis, I’ll tell you. Ole Deb just stays after me, wantin’ to hug up on me, and it’s all the dern time. BUT, I’m thinking these dern ramps may be SO foul smellin, they might help me in keeping the ole’ wild woman in check! As far as I’m concerned, it’s simply, “Nothin’ ventured, nothing gained! The definition for ramps…Allium tricoccum — also known as the ramp, spring onion, ramson, wild leek, wild garlic, and, in French, ail sauvage and ail des bois — is an early spring vegetable, a perennial wild onion. Below are a couple pictures Bonnie sent to me showing her ramps, and then her cleaning some ramps. They look similar to scallions, especially the bottom part to me. Well, with what little bit of knowledge supplied to you this morning, I’d like to share with you a couple recipes supplied from the book, Smokehouse Ham, Spoon Bread, and Scuppernong Wine,” by, Joseph E. Dabney. I tried to find an e-mail address to contact the Publisher, Cumberland House Publishing, Inc., for you in regards to purchasing the book, but could find one nowhere in the book. Again though, I believe most would thoroughly enjoy this book. Clean and finely chop the ramps and parboil them. Drain off water. Set aside. Saute the ground beef. Mix all ingredients except for the butter and place in a buttered casserole. Top with pecan-sized chunks of butter. Bake in a preheated oven at 350 for 1 hour and 10 minutes or until done. Fry in bacon drippings until tender, but do not par-boil. Season with vinegar, salt, and sliced hard-boiled eggs. Serve warm. Bonnie, this book has recipes for Ramp Casserole… Ramps (or Tennessee Truffles), Bacon, and Eggs…Ramps and Grits…Grits Souffle a la Ramps…Fried Ramps and Potatoes, Ramp-based Hushpuppies…and Pickled Ramps. Now, if the truth be known, I’m here today tryin’ to help ole’ Bonnie out with a few ramp recipes, ok? I just had a thought though, that I might flip around in this book some, and I may find that ole’ Bonnie may have been a contributor in it! I don’t think that’s the case, but it sure wouldn’t surprise me one bit if it was! Well, the ramp pudding was new to me. Shucky darn! Thought I’d had ‘em ever which way one could fix ‘em! We had ramps and ‘taters three nights ago. The Texans loved ‘em; Steve wouldn’t touch ‘em. I do double bag them when I freeze them just to make sure the odor doesn’t “escape” into the freezer. I have four ramp beds now. YEA!!!! We used to have ramp festivals way back in the woods. One that we liked was on Devil’s Courthouse Creek Road up near the Blue Ridge Parkway. A bunch of friends and neighbors just got together, pitched a tent, and dug and cooked ramps for at least 3 or 4 days. Another way I like them is to fry out some good bacon, take it out of the pan, put freshly washed and cut up ramps in the drippings to tender them, then pour in a jar of tomatoes and let simmer for about five minutes. Meanwhile, you have a Dutch Oven of rice cooking on the campfire. Serve the ramps over the rice with a hunk of corn pone and it’s some mighty fine eating. Okay Dub, so you now know all about ramps. A couple of months ago when it was still rather chilly up here I had a good bait of creasies. Does that book say anything about our famous creasy greens? How ’bout poke sallet? This is a P.S. rather than a reply! 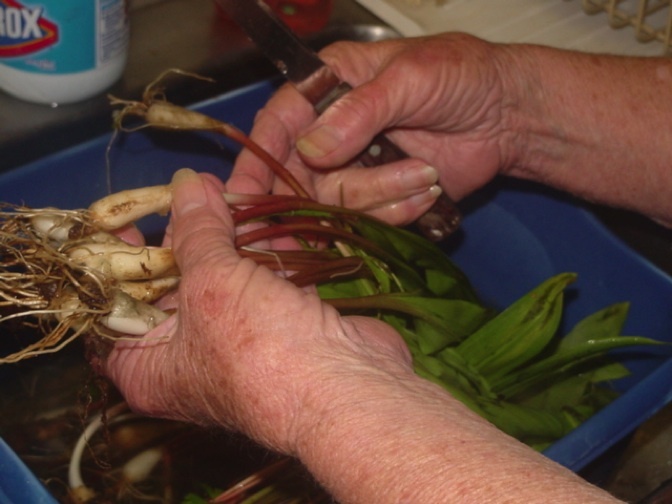 Ramps are not spring onions or wild perennial onions. I have plenty of those, also, and I don’t talk pretty to them while trying to get them out of my flower beds!